These jumbo adult tricycles are the coolest trikes in town. They are perfect for a company picnic, corporate event, or school carnival. 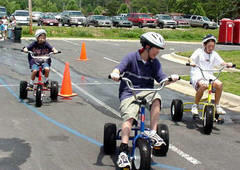 The trikes are suitable for anyone 4'11" to 7' tall! Comes with 3 TriCycles and orange cones to lay out race track.